George G. Konrad: Christian educator, administrator, clinical family counselor; born the fourth of nine children of George A. Konrad (14 December 1896, Alexanderkrone, Molotschna, South Russia – 22 January 1994, Clearbrook, British Columbia, Canada) and Maria (Lepp) Konrad (27 November 1898, Tiege, Molotschna, South Russia – 10 December 1956, Vancouver, British Columbia, Canada) in Gnadenthal, Manitoba, Canada on 13 May 1929, and died in retirement in Surprise, Arizona on 29 June 1998. On 30 September 1951, George married Katharina "Tina" Pauls. Tina was the daughter of Nicolai H. Pauls (1892–1976) and Sara (Wiens) Pauls (1899–1982). George and Tina had three children: David (d. 1956), Gerald and Dolores. Tina worked in childcare and as a nursing assistant, supporting her husband during many of his student years. 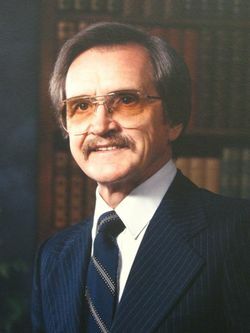 Following graduation from Mennonite Brethren Bible College in Winnipeg, Manitoba, Konrad completed his BA at the University of British Columbia, Vancouver, BC, and went on to earn a Doctor of Religious Studies at Southwestern Baptist Biblical Seminary in Fort Worth Texas, USA in 1967. Konrad taught at Elim Bible School in Yarrow, British Columbia and Mennonite Brethren Bible Institute in Abbotsford, British Columbia, where he also served as principal. In 1966 he began a long-standing teaching career at the Mennonite Brethren Biblical Seminary in Fresno, California. On leaving the seminary, he established a family counseling practice until his retirement in 1991. At the seminary, Konrad taught Christian Education courses and served as academic dean and also as interim president. He counseled many seminary students. During his sabbaticals he studied clinical counseling, and developed a counseling curriculum for the seminary, which was implemented after his departure from the school. As an ordained minister in the Mennonite Brethren Church, Konrad preached frequently and was a much sought-after speaker and resource person for conferences and workshops. He wrote on various subjects. He was also known for his advocacy on behalf of the Evangelical Women’s Caucus. In retirement he served in several short-term assignments including at the Tulpengasse Church in Austria, among Paraguayan Mennonites, with Wycliffe translators in Papua New Guinea and in Thailand. GRANDMA (The Genealogical Registry and Database of Mennonite Ancestry) Database, 5.05 ed. Fresno, CA: California Mennonite Historical Society, 2008: #109728. Konrad, John. "Konrad, George G. (1929-1998)." Global Anabaptist Mennonite Encyclopedia Online. November 2008. Web. 18 Apr 2019. http://gameo.org/index.php?title=Konrad,_George_G._(1929-1998)&oldid=123229. Konrad, John. (November 2008). Konrad, George G. (1929-1998). Global Anabaptist Mennonite Encyclopedia Online. Retrieved 18 April 2019, from http://gameo.org/index.php?title=Konrad,_George_G._(1929-1998)&oldid=123229. This page was last modified on 16 June 2014, at 18:20.